Hoot hoot! 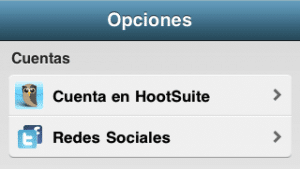 We’ve listened to your feedback and suggestions added new tools into a fresh update to the HootSuite iPhone apps (both Full and Lite versions). This release includes localization for four languages plus makes sharing content even easier – both with others via email and yourself with Instapaper. 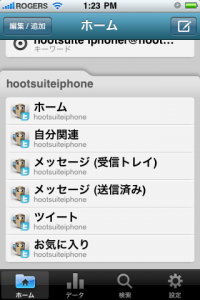 First off, on the internationalization front: HootSuite for the iPhone now has native support for Japanese, German, Spanish, and Portuguese! We’re excited to make HootSuite easier to use for non-English speakers and wonder “What language would you like to see next?” Let us know in the Feedback channel. 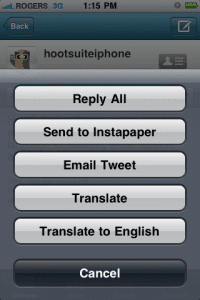 We’ve also made it a little simpler to see what people are saying in other languages with a single click to translate a tweet into your phone’s default language rather than scrolling through 50+ choices. This is extra handy for monitoring brand sentiment from other countries as well as tapping into local conversations when traveling. Want to send a tweet or link to someone who doesn’t use Twitter? Perhaps an interesting link or compelling comment about your company? … No problem. With the new “Email Tweet” option, you can pass content along to your non-Tweeting friends and co-workers with a quick click using your phone’s built in mail app. Also new in this version is another frequently requested feature: support for Instapaper. 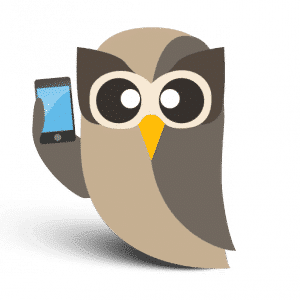 This popular web tool allows you save web content to read later with a quick click directly from HootSuite. This allows you to peruse the content at the end of a link when you have the time. How sweet is that? Folks commuting by transit or mining brand mentions will certainly love this feature. Let us know it makes life easier for you. Both the Email and Instapaper tools are accessed from an expanded menu with finger-friendly buttons … starting by clicking the arrow. 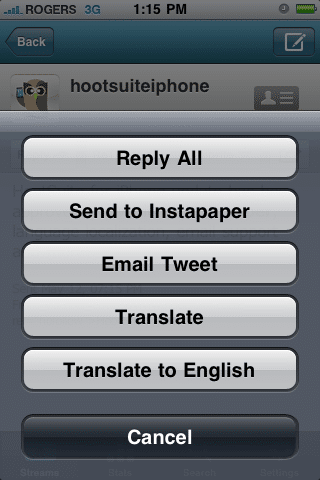 That’s not all from the HootSuite iPhone team as even more updates are in the works with even more compelling features coming soon to make HootSuite iPhone the fave choice of jet-setters, commuters, marketers on the go and anyone with a need for convenient communication. Have a great feature idea? Please contribute to the Feedback channel which allows other users to vote for your idea … plus you’ll experience lovely warm fuzzy feelings each time you use the new feature that you requested.